I'm pretty sure it's a requirement that every review of a David Gordon Green film must mention the filmmaker's odd journey from Malick-like indie darling to purveyor of mainstream star-powered stoner comedies. This observation never yielded anything interesting about the films themselves, and it's far from original now, so let's just skip it. 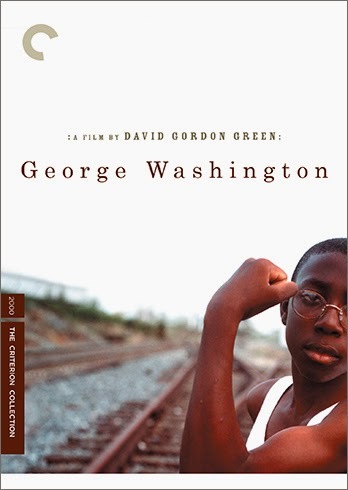 Criterion's Blu-ray upgrade of Green's first and most-loved feature, George Washington, provided me an opportunity to finally catch up with the film, and it was a little difficult not to feel wary. Clumsy appropriations of "lyrical" filmmaking techniques, poverty fetishization, mawkish magical realism flourishes -- surely this was the kind of thing that Green was trafficking in here. Call it a pleasant surprise that George Washington mostly avoids all of these pitfalls. This is no proto-Beasts of the Southern Wild. Tim Orr's cinematography and the digressive narration certainly recall Malick, but Green's episodic tale of a group of kids in rural North Carolina feels personal and specific. The film feels conjured from a memory, recalled in a hazy mix of regret and nostalgia. Mischief and romance are in the air for the adolescents played by non-actors Candace Evanofski, Donald Holden, Damian Jewan Lee, Curtis Cotton III and Rachael Handy, but the fairly carefree nature of their lives is about to be shaken when one group member is accidentally killed in a playful mishap. The rest of the group bands together in a silent agreement to keep the death quiet, but it's clear that can't last forever. Green's seemingly loose approach to directing actors draws out strong performances from his mostly non-professional cast, who don't feel stuffed into dramatic boxes. Though the film itself can feel a little mannered (particularly in its late representation of George as a superhero), it can afford to. There's a real sense of gravitas here. Green's situations and characters aren't merely props for his offbeat "vision." Lord knows we've seen a nearly unlimited supply of indie films with that trademark. Whether Green has or hasn't lived up to his debut film, George Washington is proof there's something worthwhile in there. Criterion's Blu-ray upgrade is presented in a dual-format package. The Blu-ray presents the film in 1080p high definition and a 2.35:1 aspect ratio. This is just an OK transfer, sourced from what appears to be a slightly dated master. Clarity and sharpness are a little lacking, with some edge fuzziness and slightly oversaturated colors. This softness doesn't appear to be a function of the film elements, but of the digital transfer. Fortunately, the clarity and detail is definitely an improvement over DVD and long shots don't betray the flaws as much as close-ups. The 2.0 DTS-HD Master Audio is fairly immersive and doesn't present any clarity issues, presenting the dialogue cleanly and clearly. The extras are all ported over from the previous DVD, including two shorts by Green, Pleasant Grove and Physical Pinball, and a 1969 short A Day With the Boys that was an influence on George Washington. An audio commentary track features Green, Orr and actor Paul Schneider, who plays one of the adult rail workers in the film. A deleted scene with optional commentary, a cast reunion, Green's interview with Charlie Rose and the theatrical trailer round out the disc. The package also includes an insert with an essay by Armond White and an introduction by Green.